In the late Summer of 2012 I was asked by Michael Taylor, one of the Churchwardens at St Mary's church in Hitchin to arrange to document the rehanging of the bells. He (and I) thought that the Historical Society should have some involvement in making a record of the events. 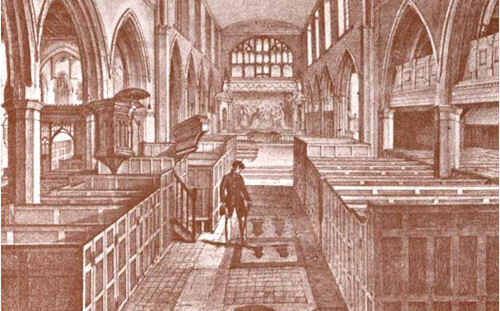 "St Mary's has a long tradition of change ringing dating back to 1552 when the church had six bells. The six bells were recast into eight in 1762 by Joseph Eayre of St Neots. The largest or 'tenor' bell was again recast by Edward Arnold at the same foundry in 1784 and they continued in use until 1905 when the tower was substantially rebuilt. At this time John Warner of London put the eight bells into a new composite iron and timber frame and recast the smallest bell or 'treble'. "In 1939 this treble was again recast and the bells rehung in the existing frame with new bearings by John Taylor of Loughborough. These eight bells were rehung again in 1980 in a frame which used the metal castings from the Warner frame but extended it for possible future augmentation to ten. In 1982 the tenor was damaged such that it needed to be recast and the new bell was cast by the Dutch founder Eijsbouts. In 1984 the ringers and their families donated the entire cost of providing two new smaller bells to make a ring of ten also cast by Eijsbouts." 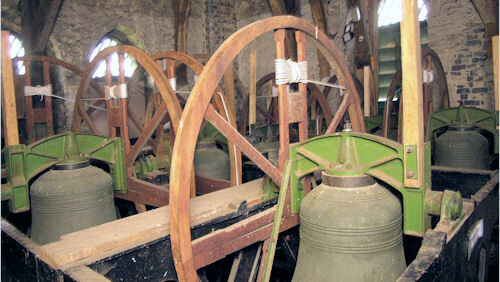 A new ring of thirteen bells had been commissioned to replace the existing ring of ten. The original tenor to the note D and weighing over 1400 kg was proving difficult to ring and particularly daunting for new, younger ringers. The decision was taken to repitch the ring in the key of E, making the new tenor much lighter at 929 kg. This would mean selling the old tenor and one other, tuned to the note G. Four new bells would be cast and the existing bells retuned to the scale of E. This would allow peals with eight, ten or twelve bells to be rung. But 'Why the thirteenth bell?' you may ask. Peals frequently use just eight bells - one octave. People new to ringing might find the low bells heavy to start with. If they were to ring eight smaller bells then they would find the ringing much easier. However, the top eight bells start on the note B. As musicians will know, the scale of B contains an A sharp which is not in the set of twelve notes in the key of E. So a thirteenth bell tuned to A sharp makes it possible to ring an octave peal in the key of B using the smaller, lighter bells. This bell is known as a 'sharp second' due to bell ringers' habit of counting the bells downwards from the top. 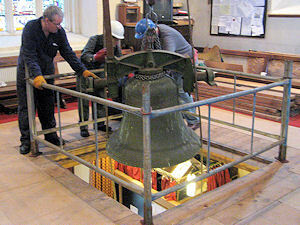 The brief was to document the bells being removed and the following events. My first reaction was to get someone else to do it. I thought that a timelapse video of the bells being lowered would be an excellent idea. The Historical Society had been in contact with a local video production company, Film Infinity who had made a timelapse film of the royal visit to Hitchin in June 2012. Sadly nothing became of this. A date was set for the start of removal. 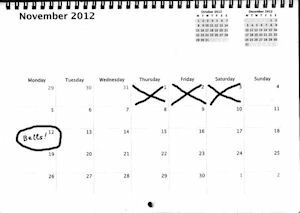 12th November. Time was ticking away! I was going to have to do it all myself. I decided that I needed some way of making timelapse videos. 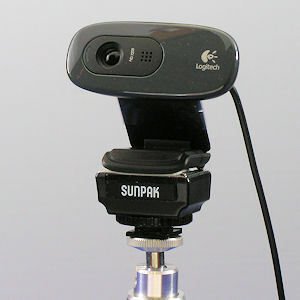 An internet search revealed that others had done it using a standard webcam video camera. Unfortunately both webcams I had at home were rather low resolution. With time running out I couldn't wait for mail order so I searched local shops on the web and found a Logitech camera from PC World at under £20. 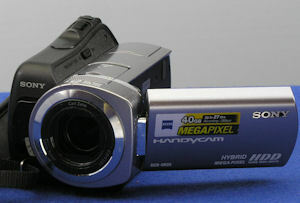 It has a resolution of up to 1280 by 720 pixels, which is satisfactory for 720p high definition video. Of course webcams have only rudimentary fixing to allow them to be clipped to your laptop or screen. A search through my photographic junk found the bottom of an old Sunpack flash gun with a tripod mount bush. Double-sided sticky pads made the structure complete. Next I needed some software to capture my images. The internet found me several candidates, though some were quite expensive. After numerous sessions recording the scene from our front bedroom with trial versions of each in turn I found a little program called FLIX that did all I needed and was cheap at $10. I couldn't get it to work with my Windows 7 laptop (finger trouble, I think), but it was fine in Windows XP on my old laptop. FLIX produces a folder full of still images numbered sequentially. It provides a built-in tool for stitching them into a video sequence, but I found it rather fiddly to use and you had to remember to do it straight away after the record session. Instead the good old standby Virtual Dub did the business. I saved the files using Xvid compression and later converted them to MPG format. Here's a short video of a small bell being lowered. Once I found a suitable spot in the church to capture the scene it was a matter of running out a mains lead to keep the laptop running so I could leave the system alone to get on with things. I had also promised to make a sound recording of the existing bells. this would allow comparison with the new bells. 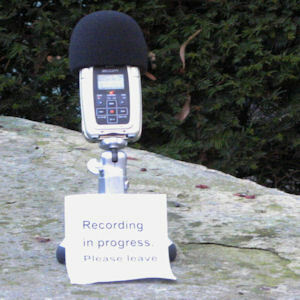 My trusty Zoom H2 portable recorder would be ideal for the job. The only problem was finding days when the bells would be rung. The 4th of November was a ringing day, but it was raining at ten o'clock. Wherever I stood around the churchyard there seemed to be the sound of water running off the gutters. I stationed myself in the entrance to Church House which provided some cover and was reasonably quiet. That is until the choir started drifting out from rehearsal and into church. The door had an almighty squeak. The evening session at six o'clock provided better weather conditions. But.... The day before bonfire night meant that a lot of firework parties were in progress and the bells were accompanied by assorted bangs and whizzes. 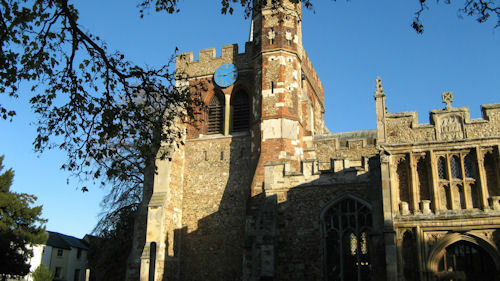 Remembrance Day, the 11th, was the last day of ringing before the bells went away. Fortunately the weather was kind and I found a good place to stand my recorder on top of the gas meter kiosk. Listen to a 25s extract. The ringers performed a quarter peal in the afternoon, but the bells were half muffled out of respect for Remembrance Day so it's not very good for comparison. 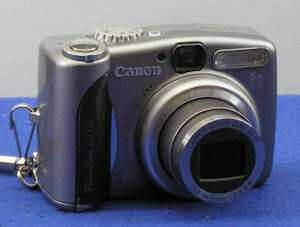 For stills work I relied on my old Canon Powershot A710 which has stood me in good stead over the years. It's not too good in low light conditions, but it's small and light and produces good images. I also took a few shots on my Canon EOS 1000D, but it proved too bulky to drag around most of the time. Having covered events in the past, albeit with a stills camera, I had some idea in my head of what shots needed to be taken. Views of the skip filling up were an obvious must. Shots of items being dropped in would be good when used in quick succession. As always it made sense to start with the preparation work. Sadly, I couldn't be in two places at once, so the downstairs work of opening the floor panels was shot, but the setting up of the hoists in the bell chamber was missed. I left the timelapse camera in the nave to give a view of bells being lowered (video above). At the same time I took shots in the bell chamber of the unbolting and lifting. Leaping down the stairs I took more shots as a bell passed through the ringing chamber (picture left), and finally down to the vestry on the ground floor. I felt rather ashamed to be swanning around with a camera while the volunteers were working so hard. Looking back on the tasks carried out, it seemed amazing that the first bell was lowered so soon as the afternoon of the first day. I hadn't realised that most of the metalwork supporting the bells had to come out. It seems obvious now. Since there are more bells to go back, they need a different set of supports in different positions. 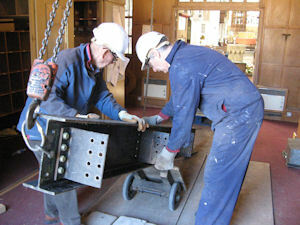 The cast iron frames went for scrap after being broken up to fit in a skip. The steel beams went the same way.